Allow Transform moves to be Relative as well as Absolute. Transform moves are currently (v 1.7.0.238) absolute based on the rulers. It would be nice if moves could also be made RELATIVE to the current position of the object. Yes, I know that one can do arithmetic in the Transform x,y values boxes, e.g. "+1.5" and end up in the place desired for the FIRST iteration of, say, a duplicate but the resultant duplicate then has a new absolute value in the x, y boxes. Instead of being "1.5", the relative move distance, it will be "2.5", a total of the original y location plus 1.5 . Any attempt to put a second duplicate the same distance away from the first duplicate as the first dupe is from the original (i.e. 1.5 ) results in an error. Why is this of concern? You cannot then do a step-and-repeat numerically using the Transform dialogue and CTRL+J. You have to move the first duplicate manually. Only then is the movement recorded as relative and only then will the relocation of the subsequent duplicates be accurate. I would say relative moves are done far more often than absolute moves anyway and should be an option in the Transform palette. Select the object (Object 1). Ctrl+J to duplicate the object, giving Object 2. In the Transform panel, move Object 2 (for example, put +1.5 in the x box). Ctrl+J to duplicate Object 2, giving Object 3. Object 3 is automatically located at Object 2 + 1.5 (that is, at Object 1 + 3). I can't decide if that's what you want, or if you're wanting something else. But both steps 3 and 4 resulted in relative moves, not absolute. Doesn't work for me. Pls see illustration with values in transform dialogue. 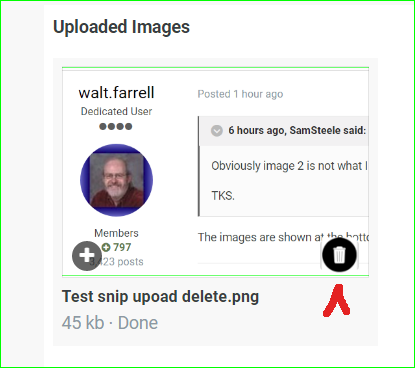 The images are shown at the bottom of the post after you attach them, and each has a delete icon (trash can). It sounds be there if you edit the post, too. I missed the trash can. It could be white on black, like the plus sign.